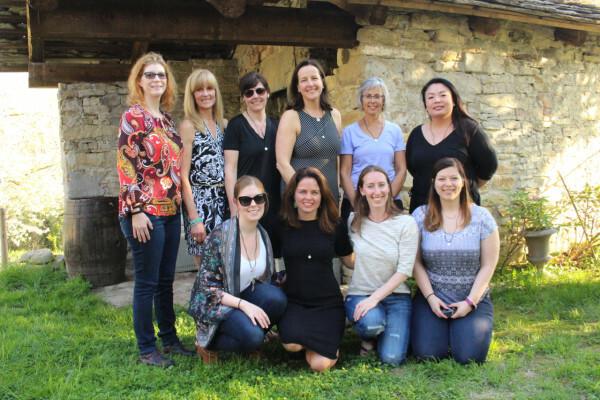 The Italy retreat was a spectacular experience for me, as I hope it was for the 12 ladies that joined me! It was a fabulous group of women of all ages with diverse backgrounds and life experience. There were new friendships made and old friendships strengthened. Our time together was meaningful, fun, supportive, a little crazy and joyous! I haven’t heard so much laughter in 1 week in my entire life! And at times, we all held space for each other to just BE… Our days were a mix of yoga, yoga workshops, hikes, long meals, and some very special activities. There was time to do nothing- or read, relax or nap. We were hosting by an amazing couple, Jerome and Charlotte, who were an example of kindness and generosity. Our meals were delicious and special and designed just for us! And, nothing beats the Italian countryside… the fresh air, the cool breeze on your skin, the rolling hills and waking up each morning to the sound of church bells, cow bells and 1 confident rooster! Getting off the grid gave everyone an opportunity to create the space they needed to re-connect to themselves, connect to each other, and explore their potential to live their life on purpose! I hope you’ll join me in Italy one day!